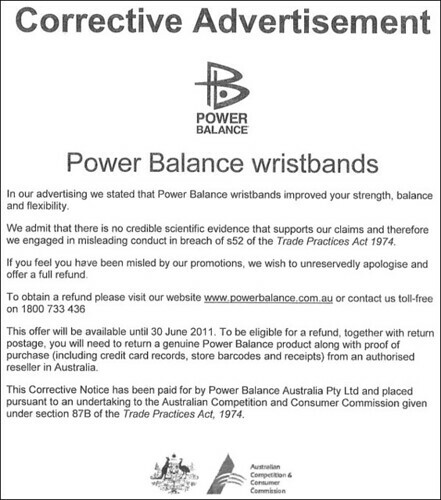 In a move that has been welcomed by skeptical groups all over the world, an Australian consumer watchdog group, the Australian Competition and Consumer Commission (ACCC) has instructed Power Balance to cease making misleading claims about their silicone bracelets. The performance sports bracelets, which have gained considerable popularity via high profile athlete endorsements, have become an essential fashion accessory around the globe, making millions for the company. Their popularity has also sparked dozens of copy cat products, to such an extent that the company established a section on their website where consumers can report a fake. The bracelets cost between $30 and $60 AUD and the pendants $90 and are claimed to increase strength, performance and flexibility. The “magic” is in the embedded hologram which is designed to “resonate with and respond to the natural energy field of the body”. But when asked to provide evidence for such claims, Power Balance admitted that “there is no credible scientific basis for the claims and therefore no reasonable grounds for making representations about the benefits of the product”. A toll free Power Balance refund line has been set up and refunds are bring offered to all consumers who felt they have been misled. In a further unprecedented move, the ACCC has also instructed the company to remove the words “performance technology” from the band itself, presumably meaning they will have to manufacture new stock. And in a further shake up, the ACCC has indicated that retailers who continue to sell the bands in their current form also risk prosecution. This is certainly a blow for the company, as it effectively means they will have to withdraw all their current stock during a period when many manufacturing companies are winding down for the Christmas break. The bands have been the subject of considerable media attention in 2010, not all of it flattering, however it apparently hasn’t made much of a dent in their sales. When Richard Saunders showed unequivocally that the bracelets didn’t work in a blind test on national television, the website crashed from increased traffic. In October, Choice magazine awarded them a Shonky for the “stronger, bendier, balanceder, dumber” product of 2010. Choice spokesman Christopher Zinn described the product as “the only effect that the power balance band has is in emptying your wallet”. They were later named “a bare faced con” by Channel Nine’s A Current Affair. The ACCC ruling might be the first move to make a dent in the enormous success of this expensive placebo in Australia. Unlike the HCCC and the TGA, the ACCC has a history of taking legal action against companies that continue to practice misleading and deceptive conduct. This includes the alternative health providers Advanced Allergy Elimination and NuEra. Since Power Balance bands will likely be off the shelves of Australian stores for a while, why not get yourself a Placebo Band. They’re only two dollars, all profits go to charity, and they’re honest about what they do! Want to know how the tricks tricks used by Power Balance and other similar products work? Watch the video on applied kinesiology below. A big hug to Richard Saunders who has worked tirelessly to expose the shonkiness that is Power Balance. UPDATE: Power Balance have now published this corrective ad on their website. UPDATE 02/01/10: There have been many copy-cat products produced as a result of the huge success of Power Balance. One such product is HotBand which Richard Saunders wrote about here . Our mate Chris Higgins decided to take up the challenge to get a large chain of discount pharmacies to remove these from their shelves and today we can report he has had some success. Chris writes on his blog today that he was informed the bracelets have been “recalled” and are no longer sold by Chemist Warehouse. Win! 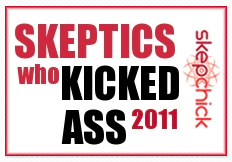 « 2010: The year in science, skepticism and woo. » Holy haleakala! Bad Universe coming to Australia!